The streets of Wentworthville were filled with the sights and sounds of celebration when the Syro-Malabar Catholic community observed the feast of St Alphonsa. Our Lady of Mt Carmel Church was filled to capacity for the celebration on Sunday 18 October 2015, which began with a novena, followed by Mass in the Syro-Malabar Rite. The principal celebrant was the Vicar General of the Syro-Malabar Catholic Diocese, Very Rev Francis Kolenchery. In his homily, Fr Francis spoke of how St Alphonsa gave Jesus to others, even in the midst of her sufferings. He also emphasised the responsibility of parents in handing over the faith and ethos they have received to the next generation. Members of the Syro-Malabar Rite originate from Kerala, South India. St Alphonsa is the first female Indian-born saint canonised by Pope Benedict XVI in 2008. Alphonsa was born was born in 1910 as Anna Muttathupadathu in Kottayam, India. Coming from a wealthy family she was offered many marriage proposals but instead chose to join the Franciscan Clarist sisters and took the name Alphonsa of the Immaculate Conception, in honour of St Alphonsus Ligouri. Her life was marked by personal holiness, but she suffered continued health issues and physical pain. Alphonsa died on 28 July 1946 at the age of 36. 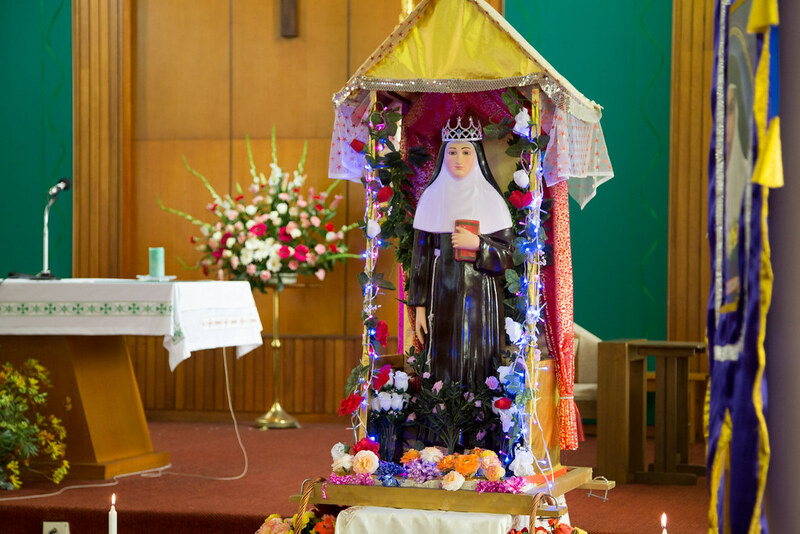 Fr Joby Kadambattuparambil Ittira MS, chaplain to the Syro-Malabar community in the Diocese of Parramatta, said of St Alphonsa, “she is a special saint amongst the Syro-Malabar Catholics as she is one of their own”. Veneration of her relics and a procession around the church grounds followed the Mass and concluded with a fellowship meal. The Syro-Malabar Church is one of the 22 Eastern (Oriental) Catholic Churches in full communion with Rome. There are an estimated 500 families in the community of the greater Parramatta area and 1000 families across the Diocese. The La Salette Fathers pastorally support the community. This Apostolic Church traces its origin to St Thomas, the Apostle, who it is said have brought Catholicism to the subcontinent. The early Christian community in India was known as ‘St Thomas Christians’. It is the second-largest Eastern Catholic Church after the Ukrainian Church and with 4.6 million believers is the largest of the ‘St Thomas Christians’. The community is experiencing strong growth in Australia and in 2014, Pope Francis raised the community to a Diocese as the Syro-Malabar Eparchy of St Thomas the Apostle. In our Diocese, the community meets on the 1st and 3rd Sunday of the month when Mass is celebrated at Our Lady of Mt Carmel Church, Wentworthville.